Here are fun things to do in Acapulco while you are visiting this iconic Mexican beach town. You can experience the cliff divers at La Quebrada, view the beautiful Mural Diego Rivera and walk through the historic Fort San Diego. The beach areas of Playa Pie de la Cuesta as well as Playa Contesa are beautiful and beach goers will like the seclusion of Barra Vieja Beach. Other fascinating cultural spots are the Chapel of Peace, the Parque Papagayo and the Zocalo where you will find Our Lady of Solitude Catholic Church. Foodies will be pleased with a trip through the local markets which can include a stroll through the Witch Doctor Market. Water enthusiasts will enjoy snorkeling and scuba diving at La Roqueta Island or a quiet boat ride at Coyuca or Tres Palos Lagoons. One of the best things to do in Acapulco for first time visitors with families is to take one of the several sightseeing tours. These excursions are wonderful for introducing you to the area whether you are interested in beaches, architecture, history, nature or the culture of Acapulco. Tours will have you viewing incredible places such as Tres Palos Lagoon, the Chapel of Peace, Fort San Diego and several beach areas like Playa Contesa and Playa Icacos. 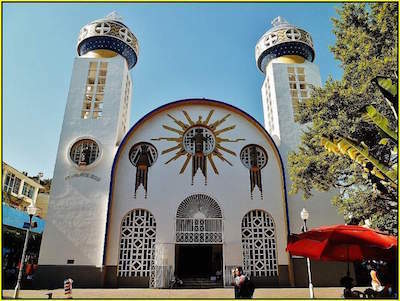 Other fascinating places you will visit are the local markets, the Mural Diego Rivera and the Zocalo where you will see the unique Spanish Moorish architecture of Our Lady of Solitude Catholic Church. You can add options such as watching the cliff divers at La Quebrada while having lunch or you can even visit a local shaman for a cleansing ritual of your body. The most popular and a must thing to do in Acapulco is to watch the artistic cliff divers at La Quebrada. You will be stunned as these cliff divers perform incredible leaps of faith from a height of more than 150-feet into a pool of water that is only 13-feet deep. Cliff divers have been a tradition at La Quebrada since the 1920s and begin their ritual by saying a prayer to the Virgen of Guadalupe. The precision of their dives is amazing as they before twists, somersaults and flips before entering the water. There are several places to view this magnificent event that happens throughout the day and night at a leisurely viewing platform or within one of several restaurants such as La Perla and Belle Vista. The most interesting performance of the day is the final dive where these skilled performers dive into a fire lit sea. If you are interested in learning more about the importance of Acapulco 300 years ago and the history of the surrounding area then a must thing to do in Acapulco is to plan a trip to El Fuerte de San Diego also known as Fort San Diego. Located near Playa Hornos, Fort San Diego is an excellent example of Spanish military architecture that was constructed to fend off the numerous attacks of British pirate ships. This beautifully restored 1616 fortress has five unique arms that were fortified with cannons and manpower to ensure the safety of this deep water port and now affords incredible views of the bay. 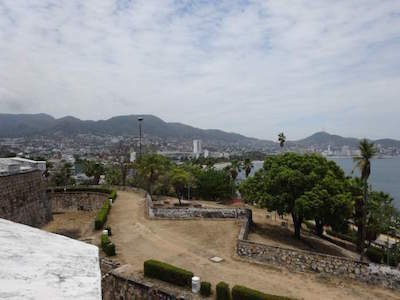 Your whole family will enjoy this historical experience which is aided by the numerous interactive exhibits which can be viewed within the Museo Historico de Acapulco that now resides within the walls of the fort. 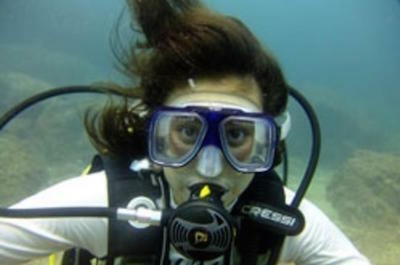 When you want to explore the fascinating underwater world that exists in the Pacific Ocean then a superb thing to do in Acapulco for all types of adventurers is to try a snorkeling tour. These tours are ideal for novice to expert snorkelers who want to view the incredible marine life that lives in the Pacific Ocean. When you are snorkeling an expert guide will inform you of the various conservation efforts that are taking place in the area that are keeping the beautiful waters teaming with marine life. Choices include a trip to La Roqueta Island where you will find interesting sea caves and the Acapulco Bay has several reefs which provide shelter to thousands of tropical fish. Other exciting options include a standup paddleboard experience, a boat ride and there is a kayak option that is sure to please everyone looking for underwater adventure. When you want to relax in a surreal natural environment that is just minutes from the hustle and bustle of the busy beaches then the ideal thing to do in Acapulco is to visit the Coyuca Lagoon. Located just 6-miles northwest of Acapulco, the Coyuca Lagoon occupies more than 28 square miles of area with plenty places for you watch incredible wildlife including numerous bird species that call this freshwater lagoon home. Once you arrive at Coyuca Lagoon you will understand why this place was instrumental in the filming of the African Queen, Rambo and several Tarzan movies. There are a variety of ways to enjoy the lagoon from a boat ride to lounging on the shores and most excursions include a complimentary lunch. 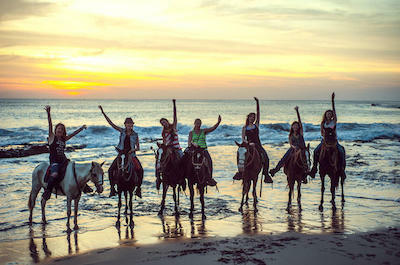 You can even take a few hours and relax at Playa Pie de la Cuesta or ride a horse along the golden beach at sunset. One of the most popular things to do in Acapulco is to take a trip to La Roqueta Island where you will find a variety of activities for the whole family. Located 10-minutes offshore from Caleta and Caletilla Beach areas, La Roqueta Island is a treasure chest of pleasure waiting to be discovered. People are amazed at the wide variety of activities around the island that range from swimming to snorkeling to scuba diving to relaxing on the golden sands. There are a few restaurants serving local cuisine and beverages as well as numerous vendors with unique souvenirs. There are nature trails that will take you to the top of the island where you can experience wonderful vistas of the built and natural environment. Don’t forget the added bonus of a boat ride from shore that can even include a unique glass bottom boat adventure. 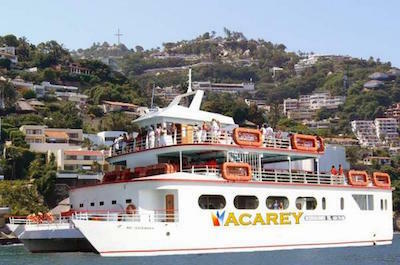 One of the best things to do in Acapulco for travelers who like to get on the water and explore the crystal blue waters of the Pacific Ocean or the mangroves in the local jungle is to take a cruise. You will be amazed at the choices you have to spend the day on the water whether you want to sail on a luxury yacht in the Acapulco Bay or take a boat ride at one of the local lagoons like Tres Palos or Coyuca. You have the choice of a private excursion within the bay or perhaps a party boat sail which includes drinks and dancing. For a more surreal day in nature try a cruise at one of the lagoons where you can glide through a mangrove forest and finish with some relaxing beach time. Nature and Wildlife tours are a perfect thing to do in Acapulco when you are ready to engulf yourself in the great outdoors while viewing the pristine landscape which is teaming with wildlife. These excursions are ideal for families who like to learn about their natural surrounding as well as about interesting wildlife that calls the jungle and waterways of the area home. You can visit places such as the Coyuca Lagoon and enjoy a relaxing boat ride or perhaps you can partake in a soothing natural Temazcal sauna. Many of the excursions include stops where you will witness baby turtles being released into their natural environment at Sunset Beach and Playa Pie de la Cuesta. Your experience may include watching a local shaman perform ancient ritual to Mother Nature and some excursions even visit the Witch Doctor’s Market to make for a thrilling day of adventure. 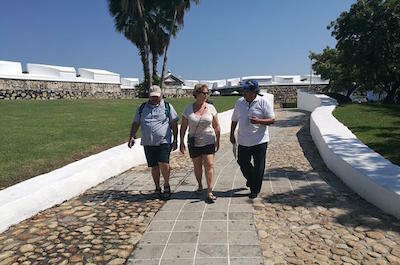 One of the more popular things to do in Acapulco for people that like to learn about the history and the historic built environment of the area is to take a historical, architectural and archaeological tour. There are a wide variety of excursions for you to choose from which will have you viewing some of the most remarkable aspects of the built environment from ancient to present day periods. Opportunities to walk through archaeological ruins at Xochicalco or Tehacalo and you can visit the petroglyphs at Palma Sola. While you are learning about unique building techniques your expert guide will inform you of interesting facts about the historical value of each location. Some tours include a stop at the Witch Doctor Market in Acapulco while other will add value with a stop at hacienda Vista Hermosa. When you need to get out and explore the countryside as well as watch the finest jewelry artisans in Mexico, then the only thing to do in Acapulco is to plan a day to Taxco. You will be delighted with your expert guide who will explain the intricacies and history of the surrounding countryside as you travel to Taxco and the surrounding areas. Once you arrive in Taxco you will have plenty of time to watch artisans create special one-of-a-kind pieces of jewelry from the finest silver in the world. There will be ample time for you to shop the markets as well as indulge in the local cuisine while you relax. Other fascinating day trips from Acapulco include a trip to Mexico City and you can even visit a Mezcal distillery where you will learn about the process of making this hardy Mexican alcoholic beverage. One of the best things to do in Acapulco for foodies and travelers that want to learn more about the interesting culture is to try one of the many cooking classes. During these excursions you will learn about the local cuisine while you follow expert chefs through the process of combining the perfect ingredients that make for a special culinary treat. You will have the opportunity to visit one of the local markets with your expert cooking instructor who will also inform you of interesting cultural and historical facts as you walk through the streets. 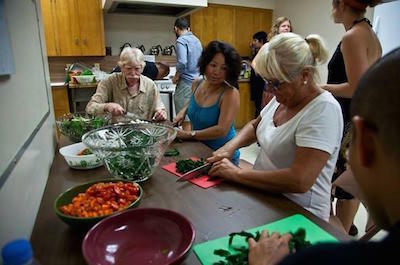 After choosing the freshest ingredients for your meal you will head back to the kitchen where you will learn how to cook the perfect Mexican dish. Other added bonuses on these excursions are relaxing on the beach after eating your delicious food and complimentary pick-up/drop-off service from your hotel or cruise port. If you are searching for an entertaining thing to do in Acapulco in the evening you should plan to take an exciting dinner experience. These tours are fantastic for families and couples who want an easy night out with interesting entertainment and great local cuisine. You will be delighted with the local cuisine that ranges from tacos to a 3-course gourmet meal at some of the best restaurants of Acapulco like La Perla and Belle Vista. The variety of entertainment makes for a perfect evening of fun watching acrobatic divers jumping from the 100-feet high cliffs of La Quebrada into the illuminated waters of the Pacific Ocean or a Lucha Libre wrestling event. There are several options that you can choose to make for a perfect evening of fun and your life is made easier with free hotel/cruise port pick-up and drop-off service included in these excursions. One of the more ideal things to do in Acapulco for families and travelers who want to learn about nature and explore the beautiful beaches is to try a horseback riding and baby turtle release tour. You will be delighted with these excursions that will have out in the natural environment while you soak up the sun and tropical scenery of coconut palms as well as the Pacific Ocean. During these tours you will first take a short drive to the Vallarino Turtle Camp where you will learn about the conservation efforts that are helping save these marine animals. Then once you are fitted with the right type of horse based on your riding ability you will trot along the pristine beaches. Families will like the quality time spent with each other and these excursions include complimentary hotel/cruise port pick-up and drop-off service. If you want to combine a thrilling adrenaline rush with some of the fabulous sightseeing opportunities of the area then a superb thing to do in Acapulco is to go on a zipline tour. You will be delighted at the newest attraction that has been constructed in Acapulco what allows you to reach speeds of 60 miles per hour as you soar more than 300-feet above the Bay of Puerto Marques. Also during your zipline excursion you will visit the Chapel of Peace where you have excellent panoramic views of the surrounding area. Lastly, your tour will make a stop at the Sea Turtle Conservation Camp where you will learn of the ongoing efforts to save these magnificent marine animals. An added value to these excursions is complimentary pick-up and drop-off service at your hotel or cruise port. 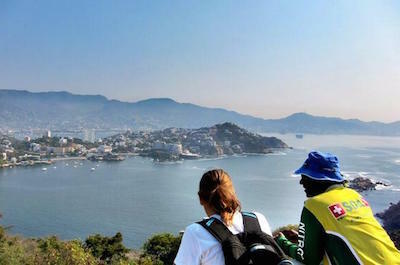 One of the more popular things to do in Acapulco that will allow you to visit several of the many iconic spots of the area is to take a walking tour. During these excursions you will have the opportunity to visit iconic places within Acapulco such as the Zocalo where you can view the incredible Spanish Moorish architecture of Our Lady of Solitude Catholic Church. Other great sightseeing options during these excursions include watching the spectacular cliff divers at La Quebrada as they gracefully jump from the cliffs into the crystal blue waters below. Your tour will also take to Fort San Diego where you can walk through this historic fortress that is packed with marvelous interactive exhibits that explain the history of the area. An added bonus for these excursions is an expert tour guide as well as complimentary hotel/cruise port pick-up and drop-off service. 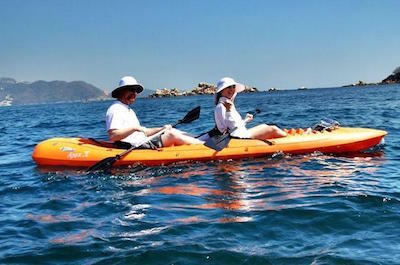 One of the best things to do in Acapulco that combines exercise and sightseeing is to take a kayaking tour. You will be pleased with these excursions that will have you paddling around Roqueta Island which is one of the more iconic areas within Acapulco Bay. 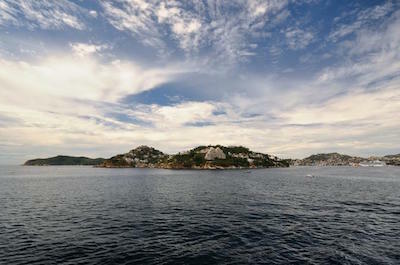 The Roqueta Island is strategically placed within the bay and separates Caleta as wells Calellita Beaches in Acapulco. As you paddle your expert guide will inform you of the surrounding ecosystem and the highlights of Roqueta Island. You will be able to learn more about outstanding landmarks that dot city skyline such as the Chapel of Peace while you are viewing the incredible marine life that lives in the bay. An added bonus is that most tours include a relaxing lunch on the beach where you lounge and take in the sun after a relaxing day of exercising and marine life viewing. If you like to explore the beautiful and interesting underwater world that thrives in the Pacific Ocean then the only thing to do in Acapulco is to go on a scuba diving tour. You will be thrilled whether you are a novice or a certified scuba with the choices of places you can view under the water. There are opportunities for shallow and deep dives that will take you through channels, walls as well as shipwrecks. There are numerous places within the Acapulco Bay and around Roqueta Island which offer the excitement of underwater adventure. Some of the marine life species that thrive in this portion of the Pacific Ocean are flutefish, octopus, blennies, morays, boxfish and eagle rays. An added bonus while scuba diving is the view of the built environment and tropical landscape that dots the coastline. 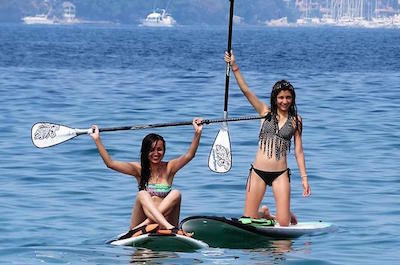 If you want to experience one of the newest trends in watersport then a superb thing to do in Acapulco is to take a standup paddleboard tour. These excursions are fantastic for families and type of adventurers who are seeking a peaceful way to explore the surrounding bays of Acapulco and Santa Lucia. During your adventure you will be able to view marine life in their natural habitat as well as view the beautiful coastline of tropical landscape and the built environment. As you standup paddleboard your expert instructor will give you tips on how to maneuver and paddle correctly whether you are a novice or expert at this new watersport. You can choose to take a lesson, a more strenuous paddle or just a relaxing time exercising on the warm waters of the Pacific Ocean. When you are finished there is always some relaxing beach time included so you can unwind before heading home. Some tours include lunch, a spectacular snorkeling option and all excursions include complimentary hotel pick-up and drop-off. When you are interested in viewing a colorful mural that brings culture of Mexico to the forefront then a great thing to do in Acapulco is to plan a stop at the Mural Diego Rivera. Located in the Las Playas area, the Mural Diego Rivera is a spectacular piece of artwork that was completed in the last days of Diego Rivera’s life. 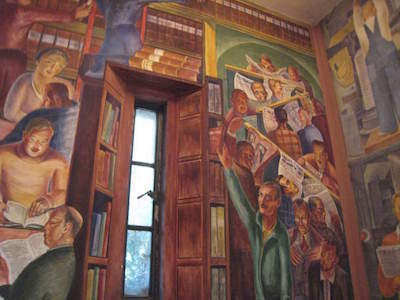 The Mural Diego Rivera was completed in 1957 at Dolores Olmedo’s house who was Rivera’s last lover. The mural is a masterpiece of mosaic artwork which includes depictions of Quetzalcoatl which is an Aztec religious figure in the shape of a feathered serpent. Other impressive messages within the mural include a frog which was Dolores’s pet name for Rivera as well as a hammer and sickle that represents his beliefs in the principles of communism. After many attempts to make the house into a museum which would highlight the last paintings and sketches of Rivera’s life, the house remains in private hands but the mural is still a visible remainder of this great Mexican artist. 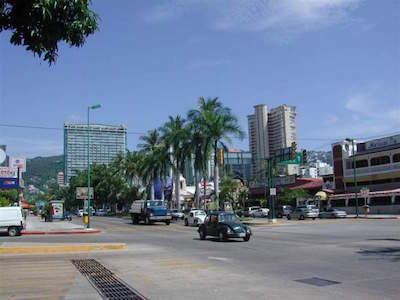 When you want to mingle with the local people while relaxing in a gorgeous open space then the best thing to do in Acapulco is to visit the Zocalo also known as Alvarez Square. Located just off of the Costera within the city center near Old Acapulco, the Zocalo is a large park which features family entertainment and is the central focal point of most Mexican or Spanish influenced towns around the world. Within the Zocalo you will find plenty of benches for relaxing, gardens which are tended by the Acapulco Garden Club as well as five water fountains. The Zocalo is the center piece of Acapulco for families with plenty of entertainment from clowns to trampolines to other games for children. The Zocalo also contains the immaculate La Catedral which is the church for the Our Lady of Solitude. The church is a magnificent piece of Spanish and Moorish architecture which features two domed towers. The Zocalo also contains a kiosko where you can listen to live music on many evenings throughout the week. 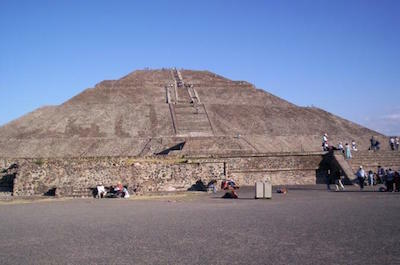 During religious or local festivals the Zocalo is the ideal place to learn and experience the culture of the city. 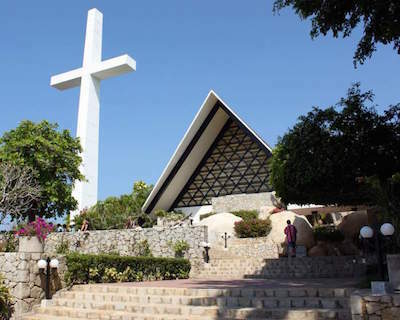 When you want to see sweeping views of the city, the surrounding area and the Acapulco Bay then a superb thing to do in Acapulco is to plan a visit to the Capilla de la Paz also known as the Chapel of Peace. Located on a hillside in the Las Brisas area, the Chapel of Peace was constructed by Carlos Trouyet who was the main developer of the Las Brisas residential area. Completed in 1971 the Chapel of Peace was dedicated to his sons who had died four years earlier in an airplane crash. The Chapel of Peace is non-denominational and is open to visitors of all religions. The Chapel of Peace features a 130-feet cross which is illuminated in the evening with mercury vapor reflectors. The grounds within the Chapel of Peace feature several statues such as of the Las Manos de la Hermandad (the Hands of Brotherhood), water fountains and manicured gardens. The Chapel of Peace is a great place to visit for panoramic views of bay especially around sunset. If you are searching for a more secluded and peaceful beach area then a trip to Barra Vieja Beach is an ideal thing to do in Acapulco. Located 15-miles southeast of Acapulco along the Pacific Ocean coastline, Barra Vieja Beach is situated near the mouth of the Papagayo River and Tres Palos Lagoon. 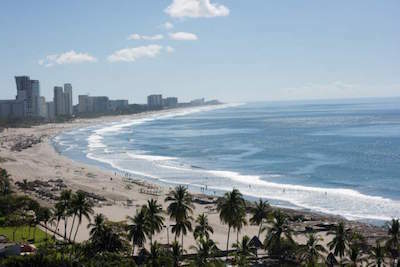 The Barra Vieja Beach consists of fine grey sand that stretches for over a mile and is ideal for lounging. The width of the beach varies from 150 to 330-feet making this area perfect for volleyball or soccer. There are some watersport activities such as surfing, bodysurfing and boogie boarding. Swimming can be dangerous with the rip currents that are associated with this area of coastline. 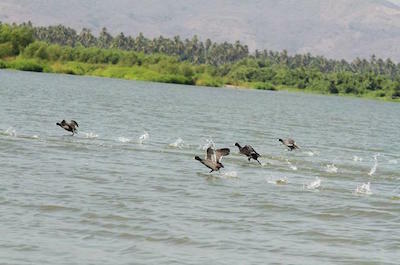 Other popular activities are horseback riding as well as ATVs tours of Tres Palos Lagoon. 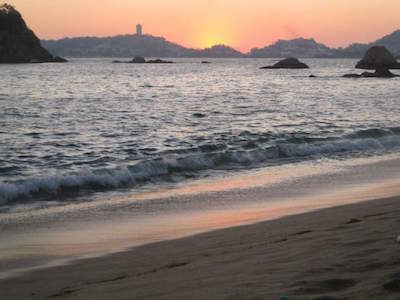 Barra Vieja Beach is one of the less crowded beaches that surround Acapulco and is kept clean by the local population. There are some services available such as watersport equipment rental but there are only a few restaurants so you should come prepared for your own picnic. Taking a trip to Punta Diamante is a perfect thing to do in Acapulco for travelers looking for luxury accommodations, a lush jungle landscape and stellar beaches. Located south of the city starting at the Scenic Highway in Las Brisas and extends past Puerto Marques to Barra Vieja Beach, Punta Diamente showcases a recently redeveloped area that includes more of the lush scenery into the built environment. Punta Diamente is home to several outstanding beaches such as Playa Bonfil, Revolcadero and Playa Diamente which all offer a tremendous amount of watersport activities. Other activities in the area include four championship golf courses and the Punta Diamante area has hosted the Mexican Open in tennis. 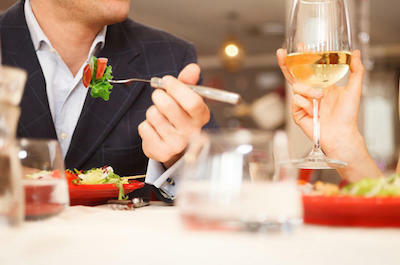 You will find numerous restaurants as well as entertainment venues such as discotheques and shopping can be found in several high end malls such as Imperial World. Photo by Damaris GV Cuenca on Flickr. Visiting La Costera area of Acapulco is an ideal thing to do in Acapulco for travelers looking for numerous activities from dining to shopping to relaxing on the beach. 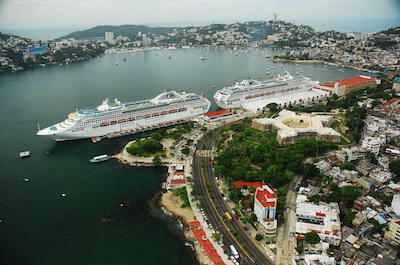 Located adjacent to the Acapulco Bay, La Costera is a primary road that runs the length of the bay from east to west. La Costera is dominated by development of hotels, shopping venues and numerous restaurants as well as other entertainment venues. La Costera also provides access to many of the stellar beach areas along the coastline of the Acapulco with Playa Icacos and Playa Condesa. Watersport activities are readily available from beachside vendors as well as through the many hotels that dot the landscape. Many travelers will visit the Zocalo which is adjacent to the La Costera area where you will find La Catedral and Parque Papagayo. In the evening La Costera comes alive with numerous discotheques as well as other entertainment venues with live music. When you are seeking a more secluded beach area that is perfect for relaxing then the best thing to do in Acapulco is to go to Playa Pie de la Cuesta. Located 6.5-miles northwest of Acapulco, Playa Pie de la Cuesta stretches for 10.5-miles separating the Pacific Ocean from the Coyuca Lagoon and allows for plenty of solitude. 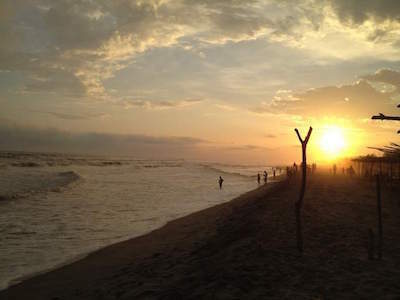 Playa Pie de la Cuesta has a nice tropical backdrop with the mangroves that surround Coyuca Lagoon and the long stretch of sand is ideal for beach games such as soccer and volleyball. There are numerous eco-friendly establishments that offer shaded hammocks for lounging and beachside drink service which is perfect for couples looking for more seclusion. Many beach goers will take advantage of the strong waves for surfing, boogie boarding or bodysurfing and sailing is also a favorite watersport at this beach. Other popular activities at Playa Pie de la Cuesta are sunset walks, ATV travel and horseback riding along the coastline. 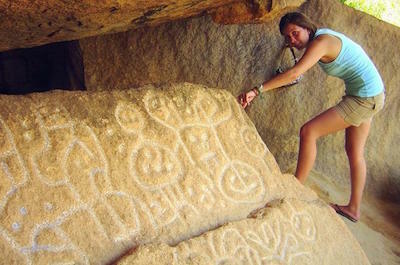 Beach goers at Playa Pie de la Cuesta can also take a peek into the past by viewing rock paintings and petroglyphs from around 1,200 B.C. which have been discovered in the area. If you like to surf or watch surfers carve some incredible waves then an ideal thing to do in Acapulco is to take a trip to Playa Revolcadero. 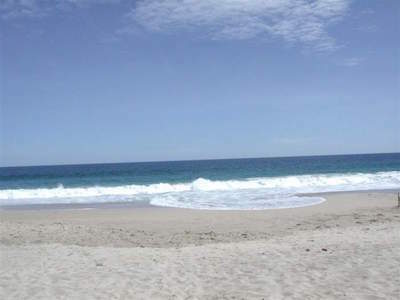 Located 4.6-miles south of Acapulco in the Diamante zone, Playa Revolcadero is an impressive stretch of grey sand beach area that is perfect for lounging and sunset walks. The greyish sands at Playa Revolcadero are created by the Lagoon of Tres Palos which is approximately 2.5-miles away to the east of the beach area. Playa Revolcadero is a favorite spot for novice to intermediate level surfers with both right and left breaks of the waves. Many people will also enjoy boogie boarding and body surfing at Playa Revolcadero but swimming is highly not advised because of the extreme rip currents. Other recreation opportunities exist with horseback riding, ultralight airplanes from the cliffs as well as ATV travel. Playa Revolcadero boasts a tremendous amount of luxury accommodations along the coastline with several restaurants in the area serving splendid local seafood specialties. When you are searching for a beach area that is ideal for swimming with children then the perfect thing to do in Acapulco is to plan a trip to Playas Caleta and Caletilla. Located in the Tradicional zone of Acapulco Bay along the Costera Miguel Aleman Avenue, Playas Caleta and Caletilla are separated by the islet of Isla de la Roqueta which also provides for excellent protection of Pacific Ocean waves making these beach areas a favorite for swimming. Playas Caleta and Caletilla have plenty of space to relax on the sand with numerous vendors that supply beach equipment as well as other watersport equipment such as kayaks, standup paddleboards and snorkeling equipment. Scuba divers will be thrilled with the Piedra de Elefante and Piedra de Hierbabuena where they can view incredible marine life within these two reefs. There are numerous restaurants that line the shoreline offering local cuisine and entertainment. Another interesting aspect at Playas Caleta and Caletilla is the Virgin of the Seas underwater chapel that is located on La Yerbabuena which is a small rocky islet separating Playa Caleta and Isla del Roqueta. Playa Icacos is one of the largest stretches of beach area that is a must thing to do in Acapulco for all types of beach goers including families. Located adjacent to Playa Condesa in the Acapulco Dorado area, Playa Icacos is a Blue Flag beach which comprises almost 1.25-miles of coastline along the Acapulco Bay and is generally not as crowded as Playa Condesa. Playa Icacos is an ideal beach for sunbathing, beach games and swimming is generally good because of Cerro El Guitarron which offers protection from crashing waves. Once at Playa Icacos you will find a variety of vendors with beach equipment as well as watersport activities that range from banana boat rides to parasailing to standup paddleboarding. 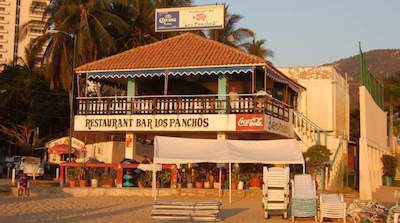 Playa Icacos boasts numerous restaurants along Costera Miguel Aleman Avenue as well as several small beachfront establishments. The beach area at Playa Icacos is wide which affords great opportunities for beach volleyball and beach soccer throughout the day. The beach area is also home to several festivals throughout the year. When you are looking for an entertaining beach area that is ideal for families and all types of beach goers, then the best thing to do in Acapulco is to go to Playa Condesa. Located northeast of Acapulco Bay, Playa Condesa is situated in the Acapulco Dorado area along Costera Miguel Aleman Avenue. Playa Condesa stretches for more than 2,140 feet and is a very busy as well as popular beach area in Acapulco where you will find plenty of space to lounge on the sand, good swimming when the current permits and lots of watersport activities that range from parasailing to jet skiing to windsurfing as well as snorkeling and sailing. Playa Condesa also offers great vantage points to view Farallon del Obispo also known as El Morro towering above the water. One of the more interesting attractions at Playa Condesa is a 150-feet bungee tower that will please adrenaline junkies. 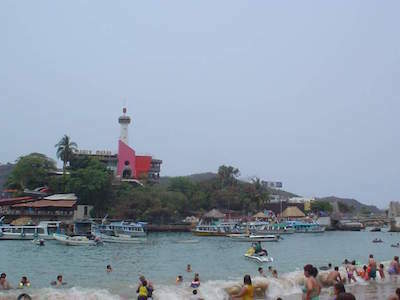 Playa Condesa is also a favorite with members of the LGBT community where many members will congregate in a specific section of the beach area. Playa Condesa does not sleep at night and you will find numerous discotheques, restaurants and several live music venues as well as a plethora of entertaining street performers. If you are interested in spending some time with locals in an environment that has many activities from shopping to dining to learning about the culture then the best thing to do in Acapulco is to plan a trip to Old Acapulco. Located in the northern section of Acapulco Bay also known as the Nautica or Tradicional area, Old Acapulco was originally developed in the 1930s by an East Texan businessman named Albert B. Pullen. 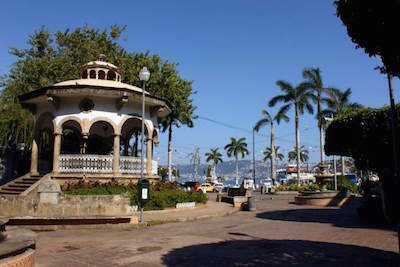 Much of the historic architecture within the surrounding neighborhoods no longer exists as Acapulco gained a reputation as a resort city. Within Old Acapulco you will find the Zocalo, the La Catedral (Church of Our Lady of Solitude), the Palacio and Fuerte de San Diego. Old Acapulco is ideal for a nice lunch at one of the many sidewalk cafes and there are numerous shopping boutiques. You can learn about the history of the area at Fuerte de San Diego where you will find an old fort with a museum. 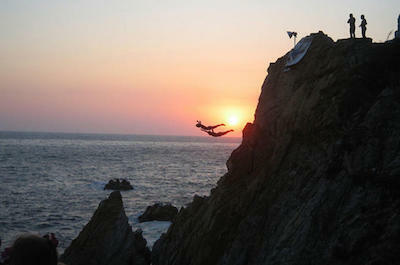 Another exciting aspect of Old Acapulco is the La Quebrada cliff divers who are a mainstay of Acapulco entertainment. 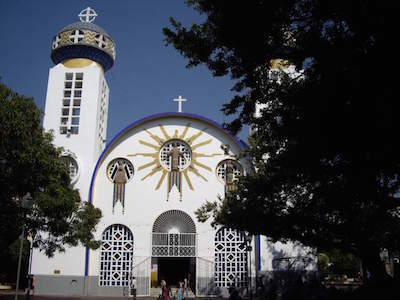 One of the most interesting things to do in Acapulco for people who enjoy historic architecture and learning about culture is to visit the La Catedral also known as Our Lady of Solitude Cathedral. Located in Alvarez Square also known as the Zocalo of the city, La Catedral was completed in the 1930s and is a stellar piece of architecture that exhibits a unique design in an older section of the city. La Catedral exhibits a Neocolonial architectural style with Moorish and Byzantine ascents that standout as the twin towers with domes. The inside of La Catedral is stunning with several hand painted wall murals, mosaics and plenty of gold tile for ascents. The church within the Zocalo is an ideal spot to relax and take in the beauty of this architectural wonder. Throughout the year visitors can experience various festivals that are related to the Catholic religion. Parque Papagayo also known as Parque Ignacio Manuel Altamirano is a perfect thing to do in Acapulco for families and outdoor entusiasts who are searching for a large green area within the city landscape. Located near Playa Hornitos between Morin and El Cano, Parque Papagayo is situated on 54-acres of protected habitat which is considered by the locals to be the Green Lung of Acapulco. Within Parque Papagayo you will find several interesting activities such as three artificial lakes which are perfect for paddleboats and there is a nice jogging/walking trail that many people take advantage of during the morning hours. Parque Papagayo has an excellent modern playground for children to enjoy and there is a children’s train that is quite unique to the area. Outdoor enthusiasts will be delighted with the aviary which houses many different species of birds and children will like the small zoo as well as the petting zoo. Other activities at Parque Papagayo include a skating rink, picnic areas, restrooms and the park holds several festivals as well as events throughout the year. 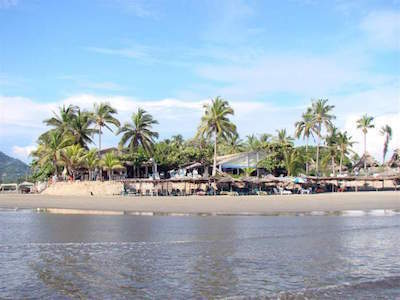 When you are ready to relax in a casual beach atmosphere that is secluded from the hustle and bustle of the main beaches along Acapulco Bay then the ideal thing to do in Acapulco is to visit Bahia de Puerto Marquez. Located 11-miles southeast of Acapulco Bay in the Diamante zone, the Bahia de Puerto Marques is formed from the La Bruja tip of the Guitarron to the north and the El Diamante area to the south. Bahia de Puerto Marques is a heavily bio diversified area which includes wetlands, dunes lagoons, marshes and beaches. The Bahia de Puerto Marques sports a lush tropical environment and lack of development which helps give the area a more tranquil atmosphere. The beaches along the coastline have plenty of area for you to lounge. The calm waters are ideal for swimming, waterskiing, standup paddleboarding and sailing. Towards the southern end of the bay you will find Puerto Marques which boasts several charming restaurants serving local cuisine. Another reason to visit Bahia de Puerto Marques is the panoramic views you will find along the scenic highway which offer breathtaking views of the Acapulco Bay and Bahia de Puerto Marques. One of the most popular things to do in Acapulco for families who are looking for a day of excitement and filled with adrenaline is to stop at El Rollo Acapulco. Located along Costera Avenue near the Costa Azul area, El Rollo Acapulco was originally part of the International Center of Coexistance in 1978 and was renovated into a waterpark in 2014. El Rollo Acapulco features nine waterslides such as Kamilancha which is 36-feet high as well as 300-feet in length and there is the Toborruedas which is a 270-feet slide in length. There are two wave pools which contain beach clubs with cabanas and the Children’s Island area is packed with water features such as fountains, slides and cannons. There is a Sky Coaster that reaches speeds of 65 miles per hour while freefalling. In addition you can upgrade your package to include three different options of swimming with dolphins. There are several options for food and drink as well as souvenir shop.